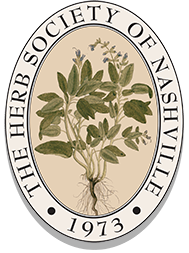 The Herb Society of Nashville (HSN) strives to be a recognized source of knowledge regarding the cultivation and use of herbs where each member feels a sense of belonging and personal worth based on knowledge gained through membership in the local and national affiliation. We proudly maintain two public gardens, one at Cheekwood and another at Centennial Park. Also, as a unit of The Herb Society of America, HSN supports the Herb Garden at the United States National Arboretum in Washington, D.C.
Our Mission: The Herb Society of Nashville is a non-profit, working organization dedicated to promoting the knowledge, use, and delight of herbs through educational programs, research and sharing the experience of its members with the community. *If you would like to be added to a Google Group to receive emails with announcements regarding the annual plant sale, Herb Day and herbal information, please submit your email address here. Note: This list will NOT be shared with anyone. To contact our website administrators, send an email to hsn-web-administrators@googlegroups.com.